Houzz 65 of our visitors have told a friend about this plan. Designed for a weekend get-a-way for the woods, the lake, or the beach. 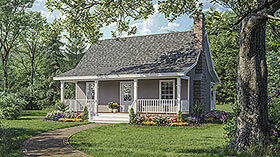 Relax in all summer/winter long in this cottage featuring. everything you need for the ideal short vacation. This home may have wood-burning fireplace OR gas logs, your choice. Expansive 12' x 30' attic storage space floored for all the "stuff" you need, and featuring an 8 ft. ceiling in the middle of the room. 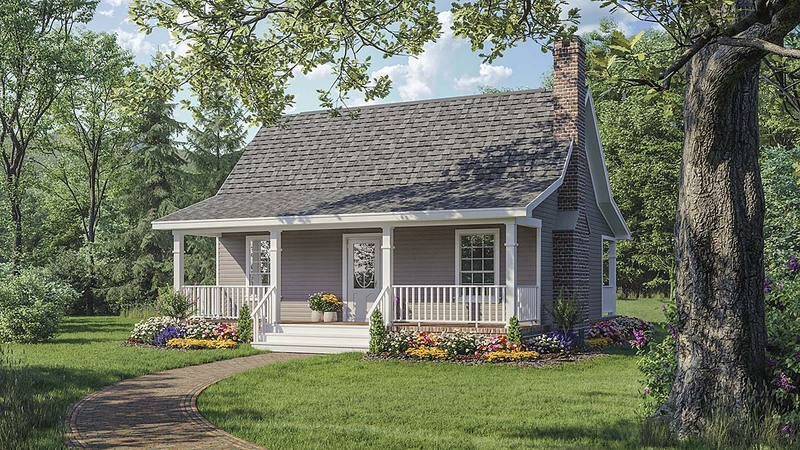 A quaint house with down-home style and comfort. Question: Can this plan be modified to have 9 or 10 foot ceilings? Answer: Hello, Yes, the porches are shown at 8' ceiling height. You could extend the walls of the living area up to 9 or 10' within the existing rooflines. There is enough height available due to the porch roofs to extend those walls without the exterior appearance needing to be modified. So that would be an easy site change to make with the builder. 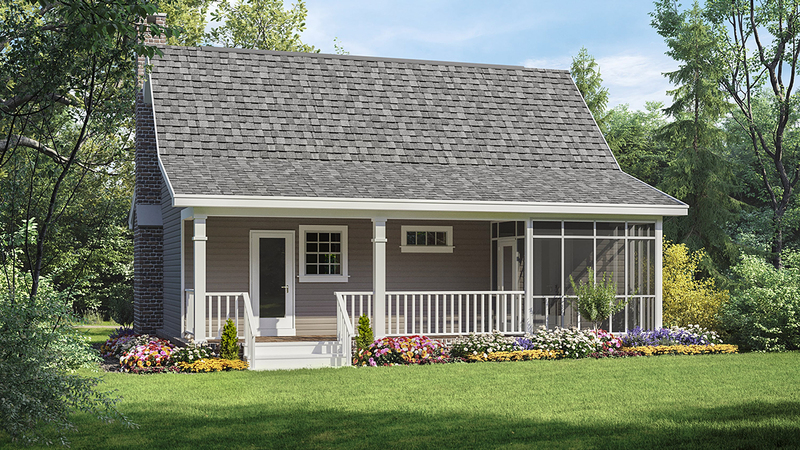 You could also choose to elevate the porches to a 9 or 10' ceiling height, which would change the exterior appearance. That could also be done onsite with the builder, or we can modify the plans for $350 in addition to the purchase of the plan package. Allow 4 to 5 working days for prelim. plans, and another 8 to 10 working days for final plans. Thanks. Question: Can plan # 59039 be built with vaulted interior ceilings following the roof line vs 9' flat shown in video. Answer: Hello, Yes, the living room/kitchen area can have a vaulted ceiling following the roofline. That change could be made onsite, or we can modify the plans for an extra $220. We have a larger version of this plan which has a vaulted ceiling and a nice video to show you what it could look like. See plan 59993. This plan also has a loft with ladder for access. Thanks. Question: Wanting to know if there is a room in attic and roof pitch looking at the one bedroom plan. Like the plans for 59110 but would like to see a fireplace in without the outside chimney. Answer: Hello, No, there is no living space in the attic. We do have the attic above the living room floored for attic storage, and there is a small window in each end of the attic. You could add a wall mounted ladder in the living room near the bathroom door for kids to climb up to a loft or playroom type area. There is no good way to get stairs into the existing footprint unless we enlarge the width 3 to 4 feet. You can see plan 59993 which is a bigger two bed version of this same concept, and it does have a ladder to a loft above. You can watch the 3d video we have on this plan and see the ladder idea in 3d. It would have to be changed slightly to adapt to the smaller plan. If you only need to add a non vented gas logs type fireplace with no chimney, that can easily be added onsite by the builder. No other modifications are necessary for that type fireplace. Question: Would it be possible to enclose the two rear porch areas to use as a mudroom/pantry and storage area? Thanks for your response. Answer: Hello, We are the designer of this plan you found at www.FamilyHomePlans.com. The fee would be $395.00 in addition to the purchase of the 5 set or the PDF plan package. When you are ready to proceed, please call the website to place your order for the plan package. Be sure to tell them that you are having modifications done by the designer. They will process the order, and send a copy to us. We will then proceed with preliminary plans for your review. We would request payment for the modification fees when we complete the work. Please allow 6 to 12 working days for preliminary plans, and an additional 10 to 15 working days for final plans to be completed. Amanda ----------- House Plan Gallery, Inc. Special Note: Customized materials list are not included in this quote. If you purchase the online material list, it will match the ORIGINAL plans NOT the customized set. We do not offer customized materials list at this time. Local builders and carpenters are the best source for those. Question: For the plan without a basement, Is the heat and hot water in the attic? Question: Have you ever built the loft version of this house? If so, do you have existing plans? Could a powder room be put in with the loft? Answer: Hello, We could use a ladder attached to the bathroom wall in the living room to climb up there if that works for you. If you wish to have a spiral stairs or normal stairs to access the space, then we will need to add about 4 feet to the right end of the house. We could shift the fireplace inward a foot or so, then enter the new stairs in the right front corner of the living room, and proceed upward towards the rear. This option would mean that only the living room would be open to above, and loft would be over the rest of it. If you used a spiral stairs, we could put them between the raised bar and the bathroom door. They would take up about a third of the great room, so we would likely need to add back some space on the end. Let me know which option you like best, and I can then give you a price to do it. The room up there would be about 12x12, with four foot tall sidewalls, some sloped ceiling, and some flat 8' ceiling in the middle with a window on the end. Have a great evening and God bless! Click Here to download a free PDF Brouchure of Plan Number 59039.